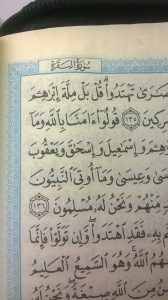 Why in the verses of the Surah AL-BAQARA is it written IBRAHM, but in the rest of the Qur’an it is written IBRAHIM? Jesus-Islam » The Koran » Why in the verses of the Surah AL-BAQARA is it written IBRAHM, but in the rest of the Qur’an it is written IBRAHIM? The Ulama, that is, Muslim scholars, cannot find an explanation for this issue. For those of you who read Arabic, here is an explanation. We have to go back to the Tawrat (Torah) to get the key. The prophet Moses explains it in his first book called Genesis (which means Beginnings). The covenant God made with Abraham. 4 “Behold, my covenant is with you, and you shall be the father of a multitude of nations. 5 No longer shall your name be called Abram, but your name shall be Abraham, for I have made you the father of a multitude of nations. 6 I will make you exceedingly fruitful, and I will make you into nations, and kings shall come from you. Abram means father of Aram, his country of origin, “wandering Aramaic …” It is means he is an exalted father, a name which, though promoting him before others, also may have seemed to mock him, because until he was very old, he wasn’t a father. His wife was barren and he had no sons. Abram and his wife were desperate to have children. The name Abraham, however means “father of a multitude” or “father of many.” Here was a name given by God to this man as a promise and covenant. This childless man would one day have a vast family of descendents. Abram, believed God, despite all the evidence he could have looked at that suggested it would never happen. Included in the promises was one very special person. In and through Abraham one person would come through whom all the nations would be blessed. (Genesis 22:18, 26:4) The Messiah, promised through Adam and Eve, would come through Abraham. In the Injil, we discover that this person is specifically Jesus, the Messiah, born of Mary, descended from Abraham.